When Bluhm Legal Clinic Director Tom Geraghty (JD ’69) got a call from US District Judge Matthew F. Kennelly in 2008 asking him to represent Jason Strong at his habeas corpus hearing, Geraghty didn’t think twice about accepting. Beyond the legal issues relating to the statute of limitations on the petition itself—which were interesting in their own right—Geraghty was intrigued by Strong’s innocence claim and the unusual facets of the case, notably, the fact that the victim was identified several years after her body was found. Because the case had both procedural and investigative elements, Geraghty set simultaneous tracks in motion in the clinic, with some students working on the habeas petition and exhausting all state remedies before approaching federal court, while others investigated the innocence claim. Over the years, the case engaged multiple classes of law students and clinic faculty who devoted hundreds of hours to uncovering the facts. On December 9, 1999 the body of an unidentified woman was found in a forest preserve near North Chicago. During the initial investigation, police followed a lead provided Jeremy Tweedy, who mentioned Sunderlin’s death to an undercover officer. Tweedy identified Strong as one of two men who beat and tortured her before dumping her body, a story that became central to the case against Strong. But Tweedy’s story kept changing; he gave conflicting statements, and he later said that he had been coerced by law enforcement. Strong confessed to the crime under interrogation; later, he also said his confession was coerced. He was found guilty in 2000 and sentenced to 46 years in prison. It wasn’t until 2006 that authorities identified the victim as Mary Kate Sunderlin. With that identification, other facts supporting Strong’s innocence claim began to surface, and in 2007 he filed the petition that ultimately brought the case to Geraghty and the Bluhm Legal Clinic. Because the clinic became involved eight years into the case, many of the team members who initially worked on it spent a great deal of time getting caught up. Jeff Davidson (JD ’09) remembered hours in the clinic conference room poring over transcripts, and piecing together the history of the case. Brian J. Nisbet (JD ’09), one of the two students who worked on the case from its inception to the end, described it as a “complex factual case,” and believes the clinic team was the first to investigate Mary Kate Sunderlin’s life. Among the key figures the team identified were Correen and Tracy Lewis, a mother-daughter con team who had been convicted of defrauding elderly people, and Gonzalo Chamizo, a mentally disabled man Sunderlin had been married to a few months before she was killed. In researching their criminal and employment histories in order to better understand their relationship to Sunderlin, alternative theories of the case emerged. The more they learned the stronger Strong’s innocence claim became. In 2009, they had their first big break when they spoke with Jeremy Tweedy, who recanted the story he told police. Nisbet called it a “major stepping stone” for the investigation—although getting Tweedy to actually sign an affidavit officially recanting his original testimony was a more difficult process. During the course of the seven years the clinic worked on the case, the Lake County State’s Attorney’s office experienced a change in leadership. In 2012, Mermel retired, and Michael Nerheim was elected to lead Lake County office. A prosecutor who entered office with a reform agenda, Nerheim immediately created an independent conviction integrity unit and began to review convictions. Judy Royal (JD ’81), visiting clinical assistant professor of law, believes Nerheim taking over as state’s attorney in Lake County was a pivotal turning point in the case. As an attorney who worked on another wrongful conviction case in Lake County for client Juan Rivera, she was familiar with how the Lake County office had operated in the past. Royal had provided counsel on the Strong case as early as 2010, and when Nerheim took over, she wanted his Conviction Review Panel to agree to further DNA testing of items from the Sunderlin investigation. These findings would allow the team to keep building the case for Strong’s innocence. During an unprecedented meeting with attorney general’s staff in 2013, the clinic argued that by gaining access to forensic and medical reports they believed they could open doubt to the integrity of the conviction. Royal described the meeting as a “cooperative search for the truth,” and one that led to a reinvestigation of Strong’s innocence claim. Maria Hawilo, visiting clinical assistant professor of law, joined the Bluhm Legal Clinic in 2013, and went on to pursue the forensic and medical evidence marshalled in the case. She recalled unusual autopsy video footage and incongruences between the state’s description of the victim’s body, and what the medical evidence showcased. Hawilo believes the medical records provided “one of the first pieces of objective evidence,” and that even with the most sensitive DNA testing available they couldn’t find any material linking Strong to the victim. Perhaps the key revelation from the mounting forensic evidence was that timing and cause of death didn’t square with the state’s theory that Strong met Sunderlin, and over the course of 12 hours, tortured and killed her. Instead, the medical records pointed to longer term injuries and a time of death up to 72 hours before her body was discovered. When the team presented the medical evidence to the Lake County state’s attorney’s office with an independent forensic pathologist verifying key facts, Nerheim’s office regrouped. Together with Assistant Attorney General Vincenzo Chimera, an agreement was reached. The attorney general’s office granted Strong’s habeas petition, in effect granting him a new trial, and the Lake County state’s attorney’s office decided not to pursue a new trial based on the innocence claim. Strong’s conviction was vacated in May of 2015 and he was released from prison. 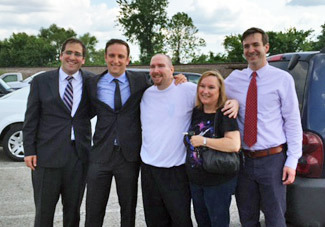 Pictured, from left: Brian Nisbet (JD ’09); David Luger (JD ’09); Jason Strong; Debbie King, Strong’s mother; and Charles DeVore (JD ’11) in the parking lot of the Menard Correctional Facility on May 28, 2015, the day Strong was released from prison. Nisbet, Luger, and DeVore worked on the case for seven years—from law student to practicing attorney. “Watching Jason walk out of prison after so many years is a moment I’ll never have again,” said David Luger (JD ’09). Luger, DeVore, and Nisbet, the three attorneys who worked on the case from law student to practicing attorney, all went down to Menard Correctional Facility to be there when Strong was released. For some students, the Jason Strong case was their first encounter with criminal law, and for others it was one of several post-conviction cases they were working on. Regardless of their familiarity level, they all marveled at the experience of working with such a large and committed group over so many years. Luger was involved in nearly every aspect of the case, from drafting petitions and appeals at the state and federal level to tracking down key witnesses, including Jeremy Tweedy. When it came time to graduate, Luger felt compelled to continue working on the case, and he and Nisbet together brought it to Winston and Strawn as pro bono work. DeVore, Luger, and Nisbet’s consistent presence on the case provided a backbone of institutional knowledge that proved critical over the years, and DeVore highlighted Geraghty’s crucial role in keeping momentum in the case going, even as students cycled in and out of the project and new faculty members were brought on. This article was written by Rekha Radhakrishnan and first published in the Fall 2015 issue of the Northwestern Law Reporter.